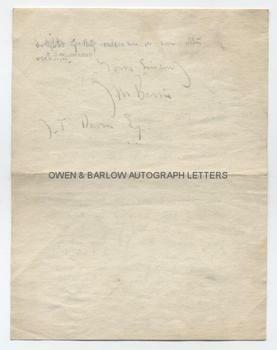 J M BARRIE Autograph Letter Signed. Sir James Matthew Barrie. British (Scottish) author and playwright. Author of 'Peter Pan'. ALS. 1p. Adelphi Terrace House, Strand. WC2. 7th October [no year]. To J.T. Davies. "Alas, I am hermetically sealed in my bed with a chill and have been for some days and have some more days of it ahead of me. I am so disappointed at not being able to accept this kind invitation of Mrs Lloyd George and the Prime Minister that I'd leap out of bed and risk it were it not that I should probably carry the germs with me and lay them low, which heavens forbid. My warm thanks to them, and I shall be uncommon delighted if they ask me on some other occasion. 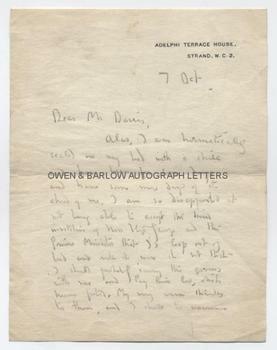 Yours sincerely, J M Barrie'. 8vo. Approx 7.25 x 5.5 inches. Slight creases and handling marks. All else fine. According to a letter of Nico Llewelyn Davies, there was a mutual admiration between Lloyd George and J M BARRIE and the two often breakfasted together at 10 Downing Street. When Lloyd George put Barrie's name forward for the Order of Merit, it was criticised in some quarters. When it was pointed out that J M Barrie did not compare with other literary recipients of the OM, such as Thomas Hardy, Lloyd George is reported to have said that, of the two, J M Barrie was the greater genius.